What would would be different if you chose to 'Lighten Up and Loosen Up'? As adults, it's easy to loose touch with our ability to play. Maybe we play with our kids sometimes or we play a sport, but are we doing it for the pure pleasure and enjoyment of it, for recreation? That's right: RE-CREATION: to create again, renew, revive, recover, restore. If you’re a recovering perfectionist like me, "lightening up" and "loosening up" takes effort. Learning how to “take it is easy” is a life skill and depending upon where you live, it may be a survival skill (i.e. Type A personalities living in Mediterranean countries [me])! What would be better in your life? …Just asking. Ask yourself, “In the end (of the day, week, year, life), what do I want?” If the answer is more fun, joy, love, or laughter, make decisions throughout each day that bring you closer to what you want. Define it. What does your Fun Factor look like? What makes you feel renewed? What in your life would you do for free because you love it, it gives you pleasure or relaxes you? Refer back to the initial question, “What would be better in my life if I (fill in the blank from bullet points above)? Decrease obstacles. Ask yourself, “What’s getting in the way of my flexibility? What’s getting in the way of lightness in my life?” Once you are aware of your fun blockers, you can get to work on diminishing them. You might begin by examining old tapes that run through your head (e.g. “Jane is the serious one. She gets things done,” says her mother in front of her sister.). Then, take a look at your beliefs and how, even those that serve you well in one area of your life, may hold you back when it comes to the Fun Factor (e.g. “Serious people are smarter, achieve more, accomplish more. Having fun is being lazy, self-indulgent, has to be earned, etc.”). Finally, start paying attention to Thinking Errors. These thoughts are mostly negative, often untrue, and can be debilitating and defeating. Some of us call them our “gremlins” or the voice of our “inner critic“. Identify one or two that are directly related to your ability to be flexible and light. Get to work, enlisting help when if you get stuck on your own. Do it. Start increasing your Fun Factor a little every day. 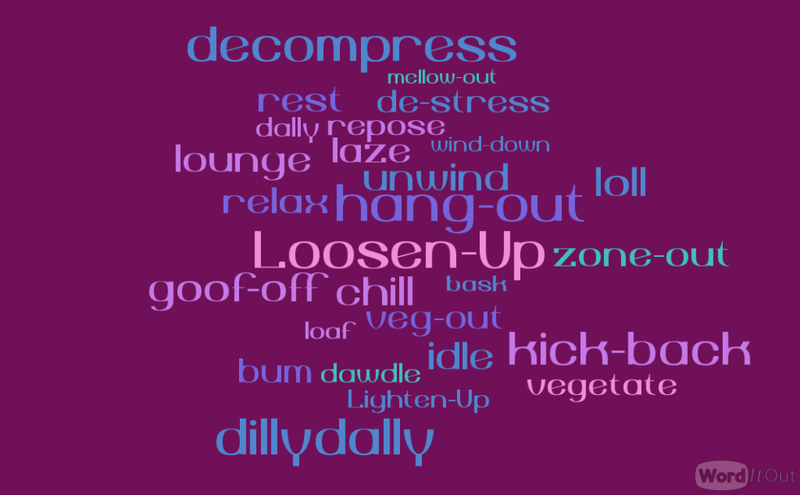 Look at your typical day and choose one or two places where you could loosen up a bit. Say yes to activities that appeal to your playful side or that increase opportunities to relax. Create “touchstones” and place them where you’ll come across them often throughout the day to remind you of your priorities. I’ve used 8X11 signs as well as little cards that I placed in my purse, used as bookmark, posted on my bulletin board, taped to the mirror or inside the toiletry cabinet, and the back of the bedroom door. You can also use an actual stone, smooth or embossed with a word of inspiration. Keep it in your pocket, within easy reach of your fingertips, as a silent reminder. In addition, I’ve gone as far as to color code my appointment calendar to include a “fun and enjoyment” category. My voice lessons, band rehearsals, time with friends, morning walk, and yoga are all labeled purple for this reason. When I’m really focused on increasing my F Factor, I can quickly see if, and when, I am falling short. Remember not to change too much too fast or put too much pressure on yourself. It's supposed to be FUN, remember? Start with small things. Do just enough to make you want a little more. For me, upping the F Factor means prioritizing fun, connection, peace, and good stress over perfection, isolation, conflict, and distress. This takes effort when juggling relationships, household responsibilities, a professional life, an inner life, and the care and guidance of a sharp-witted, busy seven year old. My methodology is a variation of Covey’s Think Win-Win and Put First Things First with a little visualization mixed in. In the end, I ask myself, WTF?